Denel has concluded an agreement for the sale of 12 South African-designed Cheetah fighter jets to the US-based Draken International. The contract includes return to service and flight acceptance tests in South Africa and aircraft delivery to the United States of America. In addition, Denel is also pursuing post-delivery logistics support for the duration of aircraft operations. Zwelakhe Ntshepe, the Group CEO of Denel, says this is a major achievement for the South African defence industry, as other South African companies will form part of the logistics support programme. Human resources and skills that were utilised during the initial Cheetah programme will again be used for the maintenance and return to service parts of the transaction while specific workshop capabilities will be established at local South African entities. Draken International is often described as “the world’s largest private air force.” It is based in Florida in the USA and has a wide range of tactical aircraft and jets in its fleet. The fighters are deployed by air forces across the globe and used for air support, pilot training and tactical exercises. The Cheetahs will be the first South-African designed fighters added to Draken International’s inventory. The sale includes nine Cheetah C jets and three, dual-seat Cheetah D planes. The planes can fly at twice the speed of sound – Mach 2.2 – and operate at ranges of more than 1 300km. Denel is the design authority of the Cheetah fighter that was locally developed as a variant of the Mirage III in the 1980s. 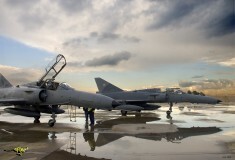 The aircraft were retired from active duty following South Africa’s acquisition of its new fleet of Saab Gripen fighter jets. Mike Kgobe, the CEO of Denel Aeronautics says Denel has received a number of expressions of interest for the remaining Cheetah fleet since it delivered 12 fighters to the Ecuadorian Air Force in 2011. Denel was also responsible for logistics and technical support of the aircraft in terms of a contract that ended in 2016. The decision to sell the Cheetahs to Draken International followed on a visit to Denel Aeronautics by representatives of Draken International in July 2017. A letter of intent was received a month later. Denel Aeronautics is further engaging with Draken International to secure a logistics support contract by end January 2018 for the supply of component and engine maintenance, repair and overhaul as well as design authority and systems engineering support. Kgobe says the ongoing support will benefit the South African aerospace and defence sectors. Denel re-established the Cheetah support base both internally and within local industry after de-commissioning of the system by the South African Air Force. This re-established support base will form the backbone of supporting Draken International. Denel recently acquired a controlling stake in Turbomeca Africa (TMA) and re-integrated the business into Denel Aeronautics. Engine MRO work on the Cheetah programme will be coordinated by this business unit (Aero Engines MRO) equipped with test benches and ground equipment acquired with the Cheetah package from Armscor Defence Materiel Disposal in 2010. Kgobe says the Cheetah contract is a viable project because of the re-established local capabilities. Denel also dealt with some of the avionics obsolescence issues on the aircraft since 2010 and is confident of supporting the aircraft into the future.